Leopold Stokowski (photo: right) conducted his first concerts as music director of the Philadelphia Orchestra almost one hundred years ago (1912). In commemoration of this anniversary, the orchestra presented a 4-concert festival led by music director-designate Yannick Nézet-Séguin at the Academy of Music where Stokowski and his orchestra made music for decades. 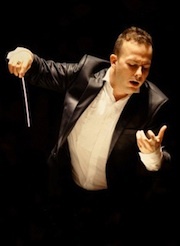 I attended the two concerts listed above and my overall impression was that Yannick Nézet-Séguin is already well into a honeymoon with both the orchestra and the audience. Frankly, Philadelphia has never seen a leader like Yannick; given the problems facing the orchestra, he may well prove a good part of the solution. As Montrealers have known for years, Yannick Nézet-Séguin is a superb musician. A huge natural talent, he has worked diligently to master a vast repertoire. He also has an easy manner with audiences. Predecessors like Dutoit, Eschenbach, Sawallisch, Muti and Ormandy rarely spoke to the audience and when they did, often erred on the side of formality. Stokowski certainly addressed his audiences, albeit in a pompous manner that did little to make classical music more accessible to them. At the end of the “Audience Choice” program, Yannick again demonstrated how charming he could be with an audience, asking them to choose an encore. It would be either Brahms Hungarian Dance No. 5 or Strauss’ Radetzky March. The audience was asked to indicate its choice by applause. The winner would be decided on the basis of the height of the green lights on the applause meter registering sound on the columns beside the stage. Philadelphia Orchestra Alive and Well! Yannick led the audience through the process with all the energy and expertise of a circus ringmaster. The audience choice? The Radetzky March, that perennial encore for the Vienna Philharmonic New Year’s Concert. Ultimately, Yannick will succeed or fail in Philadelphia on the basis of what he does with the music, and all indications are positive. 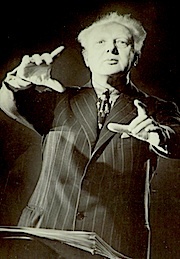 While the programs for this Stokowski Celebration were essentially chosen by Stokowski, not by Yannick, he conducted every piece with total commitment and authority. The first concert I attended was a re-creation of Stokowski’s first concert as music director of the Philadelphia Orchestra. The only change – perhaps because the program was thought to be too long – was the omission of Beethoven’s Leonore No. 3 Overture which opened the 1912 concert. Instead, this 2012 tribute began with Brahms’ Symphony No. 1 in a glorious performance. Yannick had just conducted all four Brahms symphonies in Montreal, and on this occasion, led a performance that was powerful, exciting, beautiful and entirely without eccentricity. Stokowski, a great interpreter of this music – he recorded it several times with the Philadelphia Orchestra – made many changes in the score, most notably in the big brass chorale in the last movement, where he added more brass instruments and changed the voicings of the chords to make the chorale bigger and grander. Yannick, on the other hand, played it “as written” and it was just fine. In the Brahms performance and elsewhere in the two concerts I attended, I was struck by the sonority and power of the basses and cellos. While the Academy of Music has a basically dry acoustic, the bass response is extraordinary. I understand that some renovations were done fairly recently and the result may have been favourable to bass instruments. Make no mistake: in spite of all the financial turmoil swirling around it, this orchestra remains one of the finest in the world. From concertmaster David Kim on down the principal players are outstanding and the unanimity of ensemble is remarkable. The strings play with an intensity and depth of sound that rivals the Berlin Philharmonic. The “Audience Choice” program was a very mixed bag as programming. The concept, which was Stokowski’s, entailed giving the audience a list of pieces and asking for their preferences. This time around the audience was given a list that was in part similar to what Stokowski’s might have been, with a few additions. The result was a program of mostly symphonic pops pieces and too many big finishes for a balanced program. By the time the orchestra got to the Ride of the Valkyries, it was clear that the brass players were beginning to run out of steam. This was definitely not the kind of program that Yannick himself would have chosen, but he made the best of it. He and the orchestra were especially impressive in the Stokowski orchestration of Bach’s Toccata and Fugue in D minor. This is a very effective piece and a real showcase for a virtuoso string section. Yannick made the most of all the improvisatory episodes and tempo changes, not to mention the organ-like pedal notes in the brass. In the Tchaikovsky and Dukas pieces, Yannick and the orchestra provided the live soundtrack for the iconic scenes from the film Fantasia. This meant that Yannick had to conduct the music exactly the way Stokowski conducted it to make the music match the action on screen. I understand that when this was done at the family concert earlier in the day, Yannick had some difficulty putting it all together. In the evening concert, however, it was nearly perfect. ...But the Kimmel Center Not Quite So! 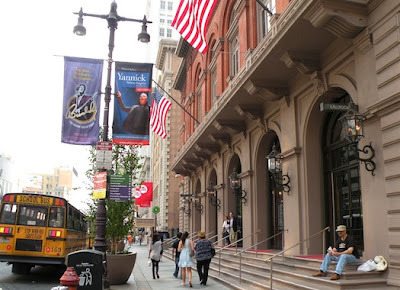 Along with many other listeners, I have been very disappointed with the Kimmel Center and Verizon Hall in which the orchestra now presents nearly all its concerts. The acoustics are overly bright and metallic and the sound lacks presence. The Kimmel is a disaster as a people place. Dark and forbidding, it’s more like a funeral parlor than an arts center. Attracting audiences to the place is going to require lots of imagination and money. Improved acoustics in the performance hall will not be enough; the lobby too will need a makeover. The Academy of Music is no substitute for a modern concert facility. It has rudimentary amenities, only fair acoustics, and very uncomfortable seats. After its recent renovation, however, it remains an impressive treasure from another age and it is an ideal place for special series such as the Stokowski Celebration. Apart from the great Philadelphia Orchestra, Philadelphia has a good deal to offer arts-oriented visitors, including a number of excellent galleries and museums, the latest being the new home of the Barnes Foundation. The original Barnes Museum was located in Meirion just outside Philadelphia and because of the small galleries and the owner’s preferences, reservations to view the collection had to be made far in advance. After much controversy, the major part of the collection was moved to a new building near the grand Philadelphia Museum of Art in the arts district on Benjamin Franklin Parkway. Albert Barnes, who died in 1951, left instructions that his paintings always be displayed according to his wishes – in what he called “ensembles” according to colors and subject matter, in small rooms. For better or worse, Barnes’ wishes have been carried out in the new building. In my opinion, these “ensembles” makes no sense at all. Each wall of each small room is jammed with dozens of paintings and other art objects, making it difficult for an observer to give each one its due. In addition, these small rooms are actually part of a large building, in which the most spacious room has no paintings at all on the walls, but rather rows of benches giving it the look and feel of a waiting room in a railway station. That said, the collection is definitely worth viewing. Reservations, which are still required, can be made at www.barnesfoundation.org. If you’re looking for a place to have dinner before a concert at the Academy of Music or Verizon Hall, there are several fine restaurants nearby. The Greek restaurant Estia is right across Locust St. from the stage door of the Academy and offers a full range of excellent dishes. Around the corner on Broad St., the Bliss restaurant is cosy and welcoming.